Six of Crows is the latest installment in Leigh Bardugo’s Grishaverse. The first installment was her Grisha Trilogy: Shadow and Bone, Siege and Storm, and Ruin and Rising (all very good books). Bardugo’s world building ability is probably one of my favorite things about this book (as well as the others). It’s full of thick descriptions of the different settings as well as each of the six main characters. Even the secondary characterizations are detailed. This is a pet peeve of mine. If authors are going to create a brand new world, I need details. 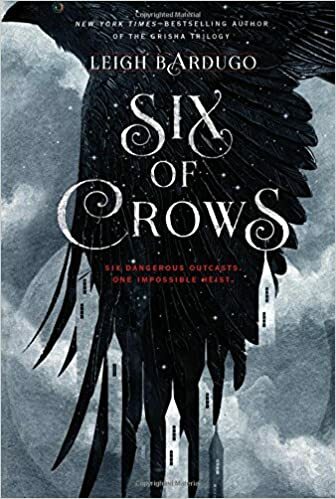 Six of Crows isn’t your typical single point of view narrative. The heist is told from six different POVs (Nina, Kaz, Inej, Wylan, Jesper, Matthias), which makes this book more intriguing. Bardugo shows us one situation in six different ways; each person showing the reader what they are feeling and thinking. The characters themselves are very flawed and each goes through a transformation over the course of the book. There is also great POC and LGBTQ representation. You will learn their backgrounds. Why they came be apart of the heist group. Their relationship to one another. And what’s truly at stake. I will say that my favorite characters are Nina and Matthias. Their stories really stuck out for me. But that doesn’t mean that Kaz, Inej, Wylan, and Jesper aren’t fascinating themselves. Keep in mind those characters are not heroes. My favorite place is the Ice Palace (when can I visit?). It’s so convoluted. It took a while to truly understand the intricacies that Bardugo was describing. And it’s not just the physical palace that is a labyrinthine but the inner-workings of the people of Fjerda (who we don’t get to know in the Grisha Trilogy). If you like adventure, fantasy, and romance give this book a read. Also keep an eye out for the follow-up post to this. I will be attending the Magic and Mayhem Tour for Leigh Bardugo/Six of Crows on November 17.